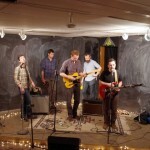 Minneapolis group Peter Wolf Crier stopped by the KRUI Mission Creek Artist Lounge on Wednesday, March 30. Not only did they vividly describe what they were wearing to radio listeners, they also talked about what it is like being a part of the Midwestern music scene today and creating “northern”-sounding music. The duo later opened for Nathaniel Rateliff at The Mill.